There has been a lot of speculation and rumors following the untimely death of actress Carrie Fisher in regards to what will happen with the main Star Wars saga. Princess Leia, who is now a General in the Resistance, is said to have a much larger role in Star Wars: Episode VIII and an even more expanded role in Star Wars: Episode IX. It was confirmed shortly after her death that Carrie Fisher had completed her role in the next sequel. Two key scenes involving General Leia have now been revealed as Lucasfilm attempts to move forward without one of their most important characters. 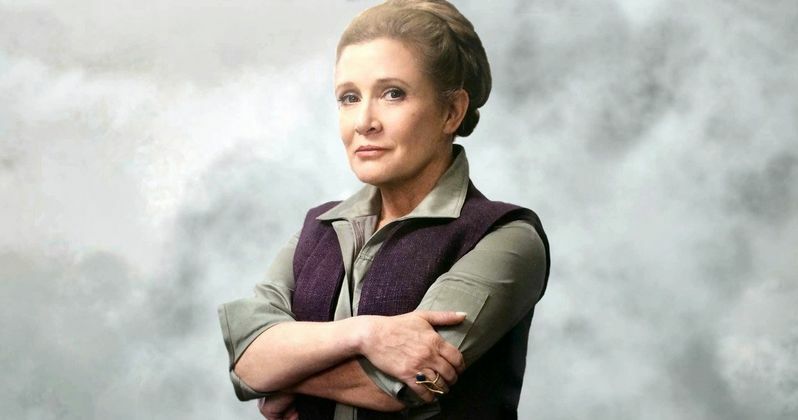 Star Wars 9 was deep into pre-production when Carrie Fisher passed, and direct Colin Trevorrow, who takes over the Force Awakens trilogy from directors J.J. Abrams and Rian Johnson for this final installment, had already written his script. Now, what is being called the Lucasfilm 'braintrust' is planning to meet and figure out just how Leia's future will unfold without Carrie Fisher. In this latest report, it was revealed that General Leia is at the heart of two very important scenes that stretch between Star Wars 8 and Star Wars 9. The Hollywood Reporter has revealed Leia's two most important scenes in the next two chapters of The Force Awakens trilogy. But now, there is a chance that these scenes may be cut. As of right now, it's not clear how Rian Johnson is gong to move forward with his sequel, which wrapped last year. But fans are in agreement that losing any existing Leia moments will be a pretty big blow to contend with. Especially considering what these essential moments contain. Here's how the report describes Leia's two big scenes, though it isn't known which of these has been shot, or where they fall into the timeline of Episodes VIII and IX. "Leia's reunion with Luke Skywalker (Mark Hamill) and a confrontation with Kylo Ren (Adam Driver), her son who killed Harrison Ford's Han Solo." As you can see, these are huge moments for the story, for the franchise, and for fans. Everyone wants to see Kylo Ren and General Leia have their face off, which could show Mother and son engaged in a battle that reveals Leia's strength with the force for the first time. But more importantly, these scenes give us Luke and Leia together again for the first time since Return of the Jedi back in 1983. The Force Awakens already denied us a reunion between Han Solo and Luke Skywalker. If these scenes are cut, fans could riot. Seriously. While this report doesn't confirm where these two scenes fall in terms of the sequels, we do know from a set photo released by co-star Oscar Isaac that Luke and Leia will reunite in Star Wars 8. But this could be the final scene in the movie, serving as a cliffhanger, one of the reasons it may be cut. The strong belief right now is that some of Leia's scenes could be cut, and her storyline will be rewritten to accommodate whatever will come in Star Wars 9. There is also strong speculation that Star Wars 8 will remain in tact as is, and that Disney and Lucasfilm will resurrect Carrie Fisher via CGI and motion capture, the same way she was brought back for Rogue One, which showed Princess Leia as a 19-year-old. The overall story arc for the final two chapters in the Skywalker movie saga have not been revealed. But with Leia being a Skywalker, her role was just as crucial as Luke's. At this time, Star Wars 9 doesn't have a set start date. It is believed that Star Wars 9 will begin shooting in early 2018, following the completion of the next spin-off Han Solo. Trevorrow is expected to arrive in Los Angeles the week of January 10 to begin meeting on how to move forward without Princess Leia and Carrie Fisher. The team does have time to find a solution, and it is being compared to what happened with Paul Walker in the Furious 7. Walker had not finished the movie, and his brothers stepped into help finish the role with the assistance of motion capture and CGI. Michael Fink, an Oscar-winning VFX supervisor who teaches at USC, had this to say about bringing Carrie Fisher back in a similar fashion for Star Wars 9. "Rogue One is the road map. I have no doubt, given some of the recent work I've seen, there are filmmakers who will be willing to take up the challenge. So far, we have seen moments of success but not full performances. Should we create additional roles for Princess Leia? I don't think so." At this time, no one is sure what the future of the Skywalker saga holds. In all likelihood, Carrie Fisher's already completed scenes will not be completely cut from Star Wars 8, but the movie could be rewritten with reshoots being considered for early this year. The movie is scheduled to hit theaters in less than a year, with a December release date already planned. Star Wars 9 is being planned for Summer 2019 but it could be delayed until December 2019, as the previous two chapters were.